Transforming spaces from ordinary to extraordinary. 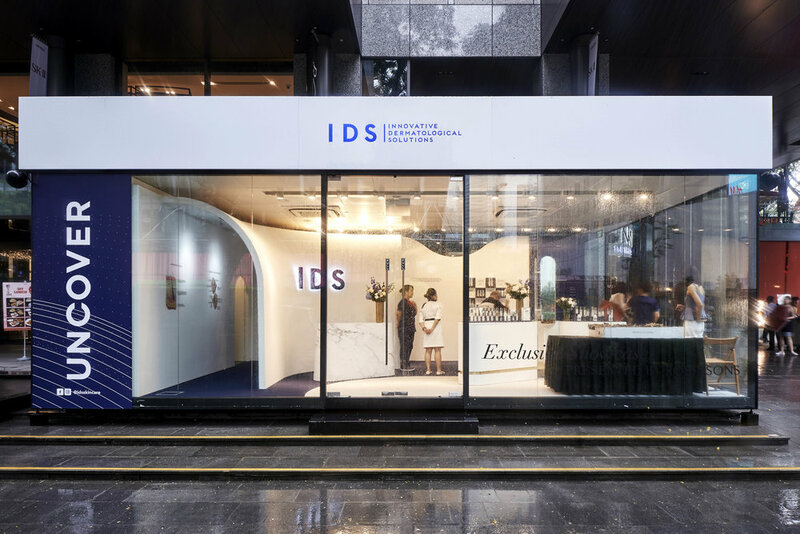 We create haptic spaces with effective commercial purpose in Exhibition, Commercial, F&B, Retail and Pop-ups. Spatial awareness, the first step in designing a space is to understand all of its parameters. With our extreme attention to detail, we believe every single element should be executed impeccably and contribute to the overall spatial experience. Through interior styling / visual merchandising, the finishing touch of the space is a key element of the design process, which most reflects the identity of the client, taking their products / services and integrating them with other elements that work in the space. Blending design with functionality, we connect people with space. 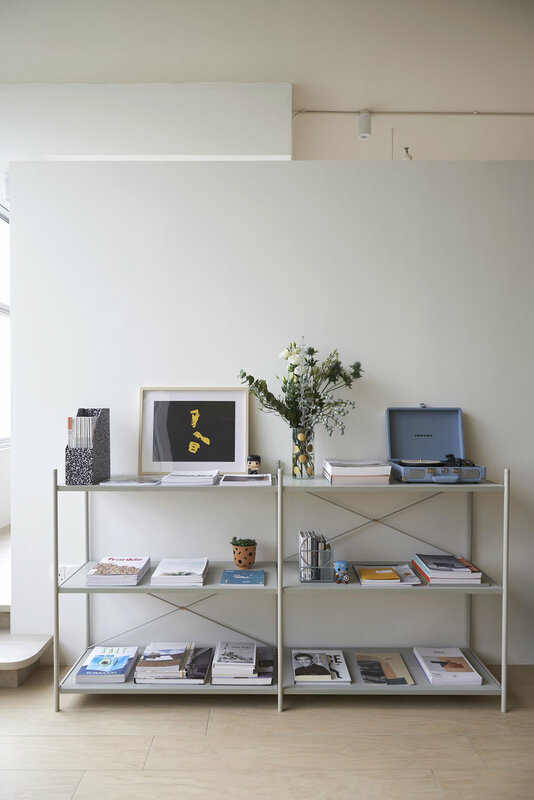 Our studio was curated to convey a sense of playfulness where different shapes, colours, materials and thoroughly thought-through details come together. Punches of colour, mix of materials and custom furniture create a joyful visual coherence, making the studio personal. Circular cutout glass window peeks through to the workspace providing the openness and privateness at the same time. The workspace is basked in light which amplifies the welcoming & warm aesthetic to work intuitively. Wood slats brought privacy and patterned tiles delimited the washroom. Micro-cement covers the exterior washroom wall while terrazzo-inspired tile covers the interior washroom wall. The curved wall portray a skin discovery tunnel for consumers to walk through and have knowledge of the skin through illustrated infographics. 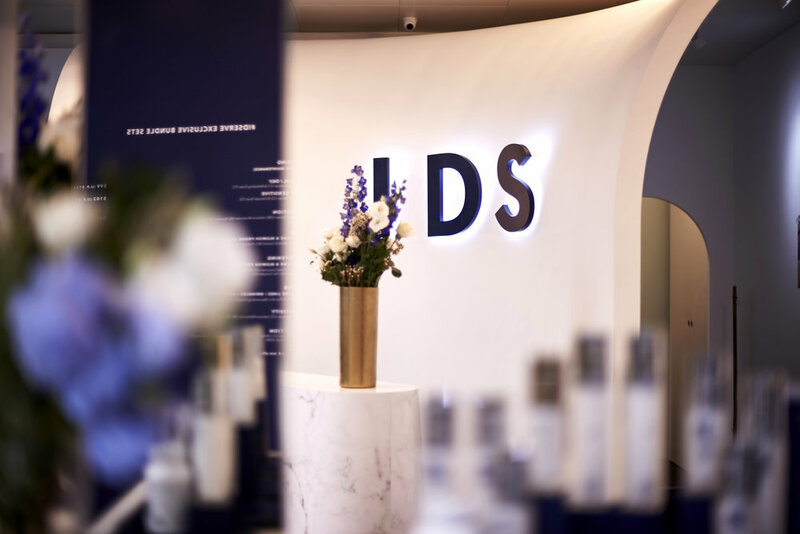 Every detail like the brass insertions and flowers in vases work to enliven IDS products, making it an experiential pop-up with a welcoming warmth and intimate atmosphere for consumers to learn more about the brand and their skin. Transforming the Samsung TV concept corners to become an approachable sensory space for consumers to experience the QLED TVs. 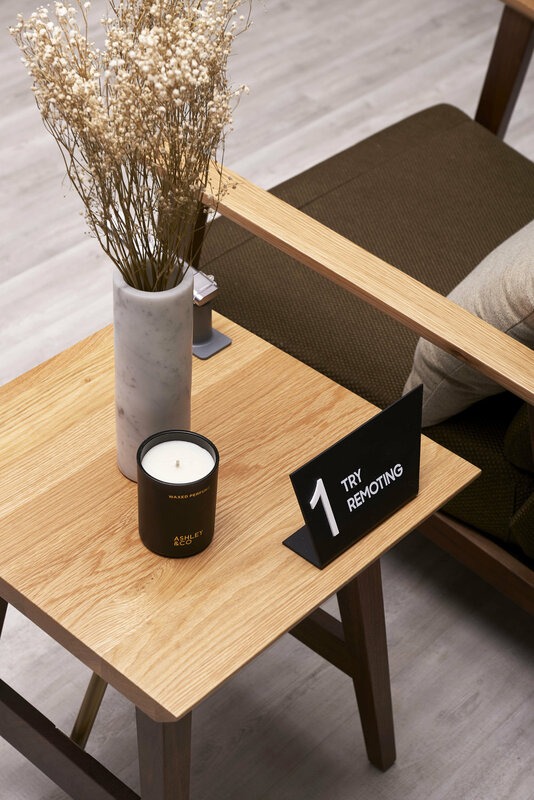 Taking visual references of home interiors, the concept corners are lined with wood panels and a selection of other handpicked materials, furniture and accessories to create a soft welcoming space with a personal touch. Nestlé Research Center is designed to be an open-plan workspace, focusing around formal, informal meetings and collaboration areas. The front third of the office is given over to a communal kitchen that encourages interaction and conversation among employees. Fostering creativity through wall-sized whiteboard for brainstorming and the library for finding inspirations. Dotted with meeting spaces, the office supports impromptu meetings and collaboration. Formal meetings will be hold in the glass-walled meeting room, which keep the space open yet private. Creating opportunities for employees to work close together, Nestlé Research Center redefines research office through this inspirational collaborative workspace. The Innovation Bubble aims to foster creativity and innovation within the space. Taking centerstage is the Nescafé Red Mug counter when you enter the Innovation Bubble. The Innovation Bubble aims to double as a casual and formal space while still creating an open atmosphere, has been achieved with the use of glass panels and swing door. The brand familiarity of Nescafé is presented through the hints of red accents yet giving warmth and liveliness to the space. The Innovation Bubble is a converging point, a conversation starter and where innovation begins. 藤 Teng Bespoke continues to focus on making vegetarianism a modern and unpretentious experience. Suspended light fixtures provide an ambient lighting while the wood elements create an inviting atmosphere. Keeping a clean palette, the space encourages diners to concentrate on the food and surroundings. The concept was inspired by Japanese Zen aesthetic, Seijaku (静寂), drawing parallel relationship with the “inner-calm” perspective of vegetarianism. The space is constructed by simple lines, shapes, materials and colours, drawing together a harmonious and calming ambience. Thus, putting focus on the dishes, encouraging the appreciation of the art of food and space. 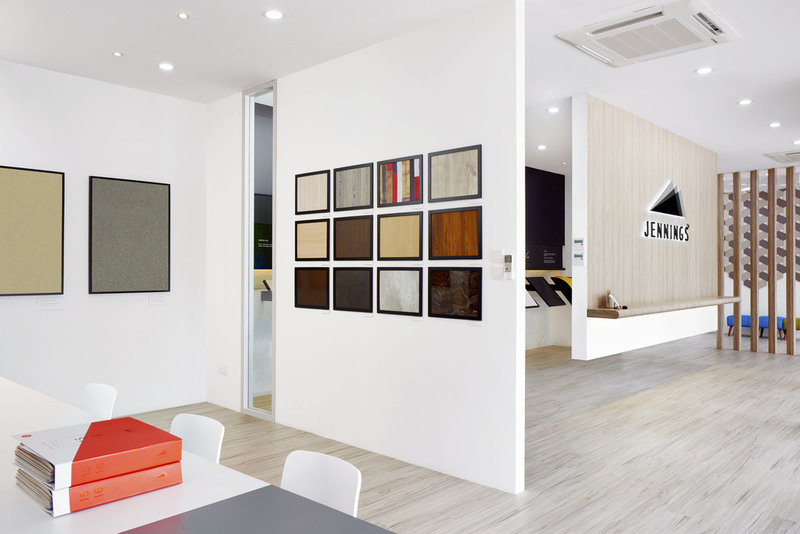 Overhauling its design and branding, Jennings wish to redefine the customer experience through a visually exciting showroom. The neutral palette complements the myriad of laminate collections on display, evoking the company’s promise of only the finest of laminates.